July 1. Owner invested PHp 500,000 cash along with computer equipment that had a market value of php. 120,000 two years ago but was now worth Php. 100,000 only. July 2. Paid php. 15,000 cash for the rent of office space for the month. July 4. Purchased php. 12,000 of additional equipment on credit (due within 30 days). July 8. Completed awork for a client and immediately collected the php. 32,000 cash. July 10. Completed work for a client and sent a bill for php. 27,000 to be paid within 30 days. July 12. Purchased additional equipment for php. 8,000 in cash. July 15. Paid an assistant php. 6,200 cash as wages for 15 days. July 18. Collected php. 15,000 on the amount owed by the client. July 25. Paid php. 12,000 cash to settle the liability on the equipment purchased. July 28. Owner withdrew php. 500 cash for personal use. July 30. Completed work for another client who paid only php. 40,000 for 50% of the system design. July 31. Paid salary of assistant php. 700. July 31. Received PLDT bill, php. 1,800 and Meralco bill php. 3,800. 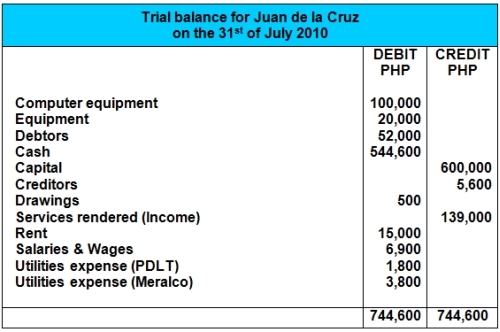 Prepare the journal entries, T accounts and trial balance for this business. A: This is a really good question to practice. Owner started business with cash and computer Eqpt. 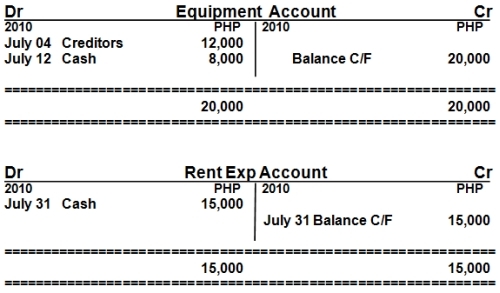 Paid rent of office for the month of July. Equipment purchased for business use. Services rendered for a client. Paid wages to assistant for 15 days. Creditors of Eqpt purchased, settled. Owner withdrew cash for personal use. 50% amount received by a client on a/o work completed. Paid salary to the assistant. PLDT and Meralco have been assumed to be the utility companies. Note: In this example we have combined salaries and wages into one account, but sometimes in real life these are kept separate - one account for wages and another account for salaries. There you go. Hope you liked this detailed accounting question and answer. Sir thank your for this example... Can you please provide the trading, p and l and balance sheet of this example? 1. Inventory at 31st October 2017 is $520. 2. Prepare Journal accounts and Ledger accounts, balance off the accounts. 3. Trial balance for 31 October 2017. 4. Statement of comprehensive income for 31 October 2017. 5. Statement of Financial Position for 31 October 2017. What is Balance C/F and Where Did It Come From? "C/F" stands for Carried Forward. It is just a term used in accounting to mean that you will take a balance from one period and "carry it forward" (copy it) to the next period. For example, we will carry forward the balance of $600 cash on January 31 to February 1 (the next period). 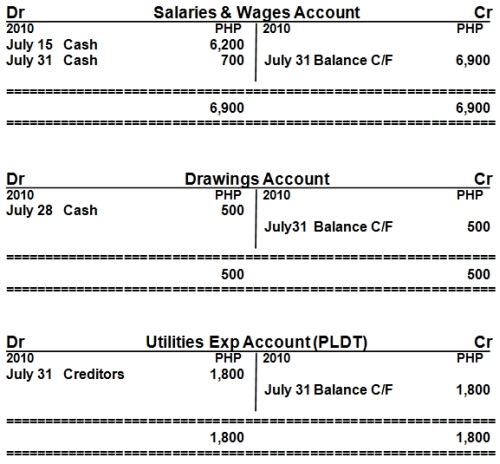 See the detailed lesson on how to balance a T-account for more information. 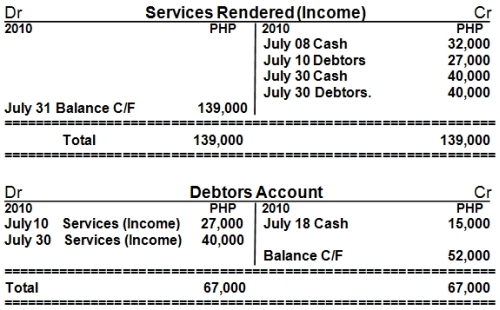 Instead of using Debtors Account Use Accounts Receivable. Instead of Creditors Account use Accounts Payable. 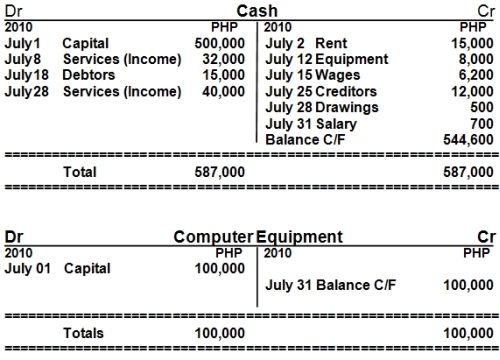 In that way its more clear that you have receivables and payables. I really don't know if this journal entries as what you presented as example is applicable to the Philippines. Specifically the entries like debit debtors credit cash? or credit creditors debit cash? You know what I mean? This samples that you have is not that typical source that we can rely on for our studies. Especially we are accounting major. Received cash from debtor (Mr. X). Creditors of Equipment purchased, settled.